At Reverie, we are committed to how we source, roast, and serve our coffee. Our fresh beans come from various origins around the world and are chosen through rigorous sourcing processes. At the cafe, we strive to satisfy each individual customer by providing multiple brew methods on bar. We offer pour overs, craft espresso beverages, cold brew, and delicious drip coffee. We are driven by our wonderful community that gives us roots. Reverie is a comfortable place for anyone to meet, study, or even just relax and get some alone time. We ignite meaningful connections among our team members and customers, creating a place for opportunities to happen, and the community to thrive. We spend quality time on each beverage that makes it on our menu. Our staff spends weeks, sometimes months, to test and develop a tasty drink. Have questions? Our baristas would love to take you step-by-step on how they’re constructing your drink with care and consistency. 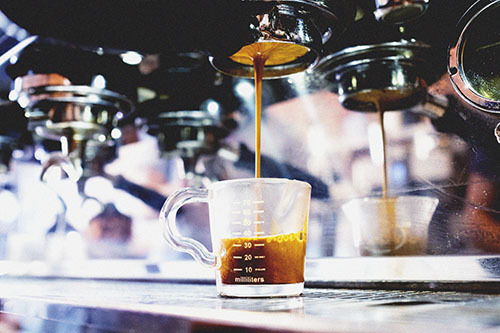 We love to enhance your experience with our knowledge on coffee and we appreciate your patience as we prepare them behind the bar to fulfill your craving for our hand crafted beverages. We lovingly accept the endearing nickname “foreverie” because we know that each drink is made with care- and we’re proud of that! Use the hashtag #loveforeverie to share your favorite Reverie specialty drink photos on social media! Not enjoying the coffee provided by your workplace? Our beans are guaranteed to bring delightful aromas and flavors when you brew them at work! We would love to provide you with coffee that keeps you going through those long meetings and busy days. We’ve chosen quality every step of the way; now you can offer your employees or clients delicious coffee as a treat to their hard work (and ensure productivity). We want to be your choice of specialty coffee that you are proud to promote and display in your own space. Visit our Wholesale page for more information and submit a wholesale request! i need this in my [work] life!